Okay, where did June go? One day it’s the Rose Festival and strawberry season in Portland and the next it’s the Fourth of July and the Blues Festival. I was busy in June; I wrote curriculum, helped my son prepare for the ACT exam, helped him research colleges, officiated for Oregon Swimming at several meets, and even managed to go to the Chinese Garden once. But in all that time, I didn’t get a chance to write. Now that a month has passed, it’s time to get back to the keyboard. Today’s recipe is perfect summer fare, which makes sense since it’s from the sunny islands of Ittamar. Like many Tamar dishes, it’s light, refreshing, and savory. It all starts with the marinade, which is a simple combination of coconut aminos, coconut vinegar, honey, green onion, and ginger. Coconut aminos taste similar to soy sauce, but without the saltiness (or the soy). And it’s gluten-free! If you wish, you could replace it with soy sauce (some gluten-free versions exist), but I prefer the lower salt content as well as the lower glycemic level of the coconut aminos. As I mentioned in my last blog entry, it’s that high glycemic level of soy that eliminates it from the paleo diet Alan follows. I didn’t mention, however, that my doctors have recommended I stay away from soy because it is an estrogenic, a food that contains estrogen. Four years ago I had breast cancer, an estrogen linked form. Obviously I survived and am fine, but my doctors think it’s best for me to stay away from estrogenics like soy. Lucky for us, there are coconut aminos! 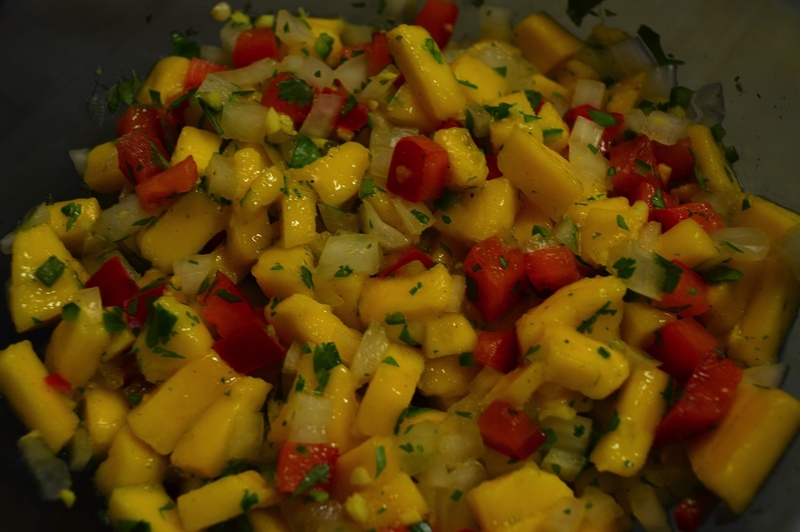 Oh, and did I mention the mango salsa? 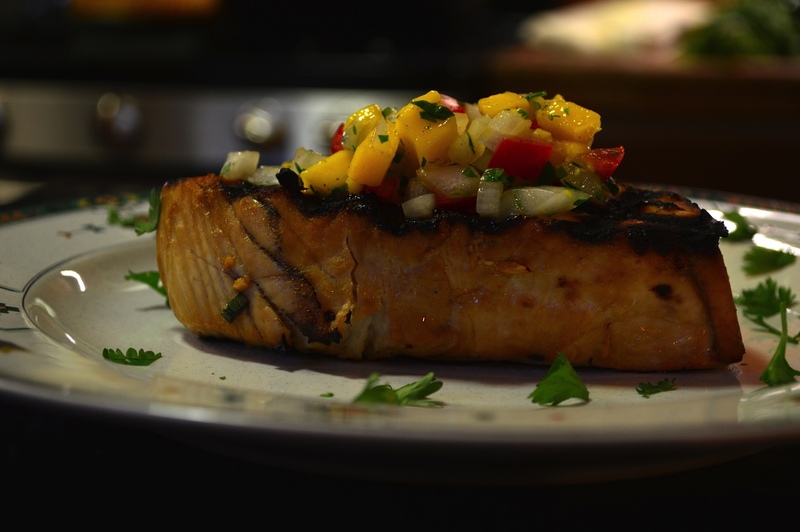 What’s better in the summer than grilled fish with mango salsa? 1. Combine all the ingredients for the marinade in a glass bowl (avoid aluminum since it can react to the acid). 2. Pour the marinade into a ziplock bag or glass baking dish. Add the fish, cover (or zip closed), and refrigerate for at least one hour, no more than six. Turn the fish over from time to time. 1. 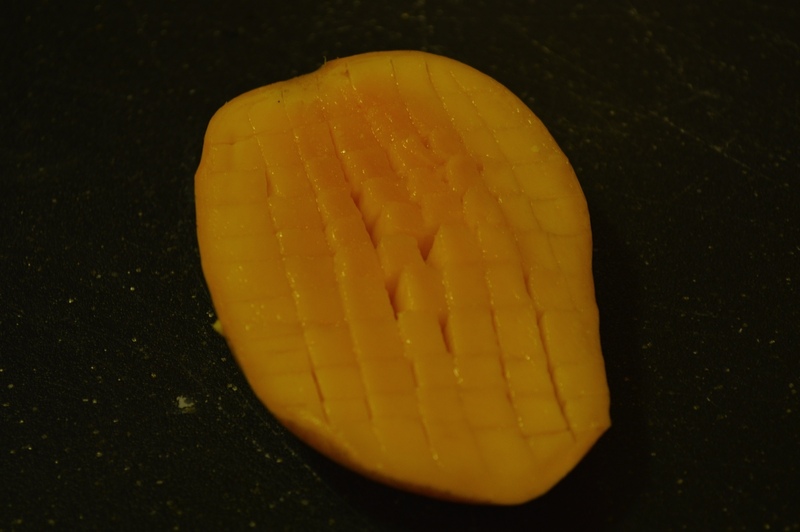 Mangos have a large, fairly flat seed, which you need to remove without losing too much of mango flesh. To do this, you first need to locate the seed. Look for a line on the outside of the mango that divides it into hemispheres. The seed is just beneath this line. 2. 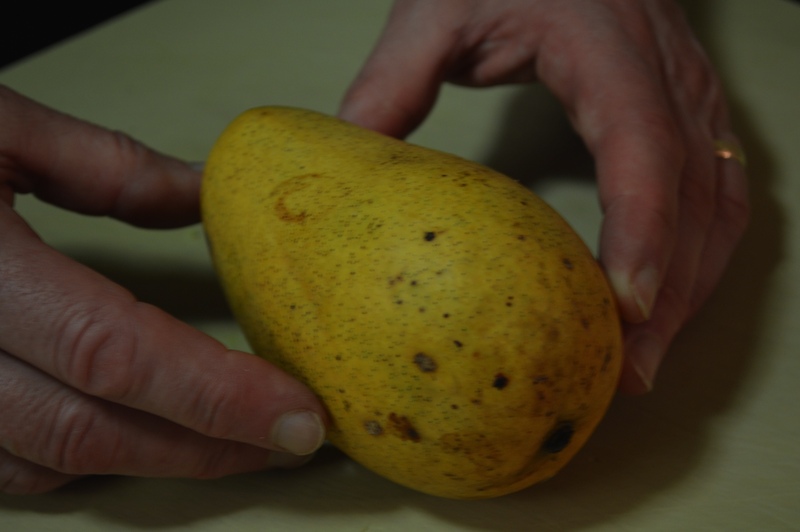 On a cutting board, place the mango on its side with the seed positioned vertically. 3. 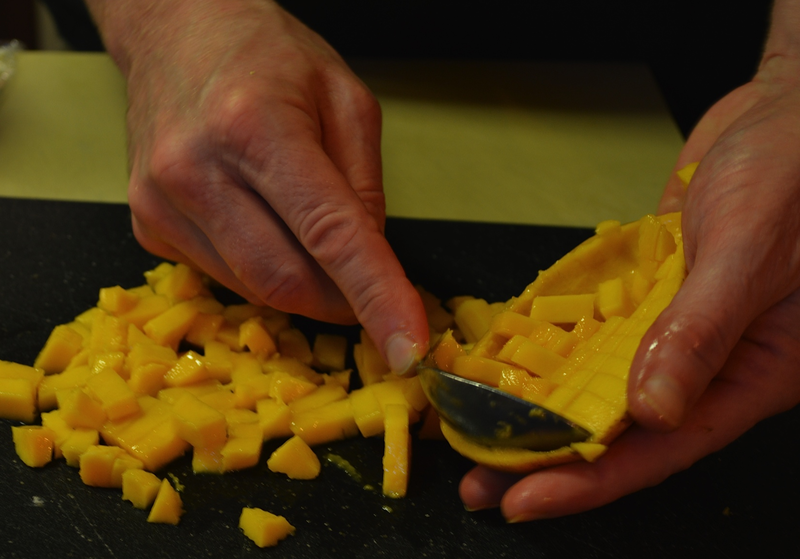 Using a sharp knife, slice down through the mango about ¼ inch off the center line you located earlier. Slice first on one side of the seed, then the other. If you hit the seed, move your knife slightly farther away from the center. 5. To remove the flesh from the skin, make a series of parallel cuts through the flesh about ¼ inch apart, first the long way, then across the short way. Be careful not to cut through the mango skin. Use a spoon to scoop the flesh out of the skin. Cut through any pieces that weren’t cut completely through. You now a have a nice pile of mango cubes! 1. Combine the mango with the onion, red pepper, serrano, lime zest, ginger, and most of the cilantro. 2. Add the lime juice and season with salt and pepper. 3. Let sit to allow the flavors to come together. 1. Preheat the grill (to a medium heat if using a gas grill). 2. Pour some oil on a paper towl and rub the grill grate to coat it well. 3. Place the fish on the on the grill. (If using coal, place the fish about 4 inches from the fire.) Cook for about 3-5 minutes on each side depending on how hot the grill is. Brush with additional marinade from time to time. Do not overcook; the fish should be pink and moist in the middle, not dry. 4. Serve the fish with a spoonful of the mango salsa on top. Sprinkle the fish and the plate with cilantro.